Over the years as we have explored and gone on fooding adventures to check out different cultures and cuisines, we have fallen in love with more and more varieties of dishes. Even with all of that exposure, I still have a special place in my heart for my original love and favorite growing up - Italian food. Now, armed with more knowledge of the cuisine and having been exposed to the thrills and communities of Italy itself, I find that the dishes I had known in the past to be Italian have usually been modified for the American palate and people. 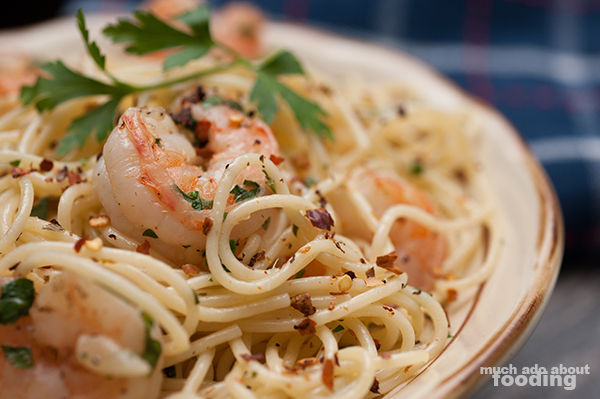 For example, the commonly seen dish called "shrimp scampi" is actually a tad redundant as scampi in Italian means "prawns." Shrimp...prawns? 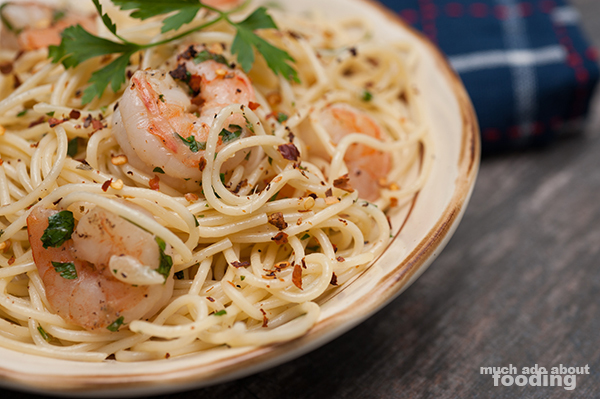 This dish of "shrimp scampi" is a combination of delicious shrimp, butter, and white wine - sometimes over pasta. Despite the slight inaccuracy, it has become a staple in Italian-American cuisine, and honestly, there is nothing wrong with preparing this; cultures evolve and change over time as does the food associated. Making this dish is an easy way to satisfy many and turn a regular weeknight into a delight. My recipe below omits the white wine for convenience's sake so my apologies ahead of time if you were looking for one with it! I chose the 31-40 size shrimp because these buggers will be big enough to sate one's appetite for shrimp but small enough to result in multiple per serving. Prepare your pasta according to its directions. As the water is boiling for that, devein and shell your shrimp. Keep the shells and tails to make shrimp stock in the future! 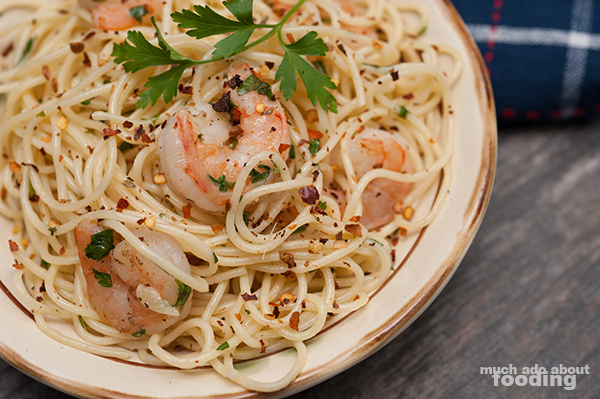 Mix shrimp, garlic salt, and black pepper together to coat. In a large skillet, melt butter and olive oil together. Then add in garlic and stir for about 1 minute's time. In a separate bowl,combine parsley, chile pepper flakes, and lemon juice. Add shrimp to the skillet with the garlic butter. Cook until it is barely orange/pink all over and turn off heat! You don't want to overcook the shrimp or it will become rubbery. Add parsley-lemon mixture - this will cook the shrimp further from the acidity. Then toss in the drained pasta and combine thoroughly, coating each strand with the buttery garlicky sauce! Voila - perfection.